War-date Confederate Document Signed by F.N. Watkins and J.W. Pennington, 1pp. 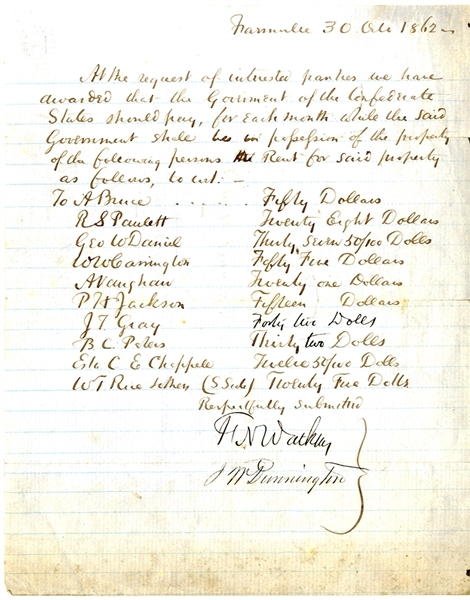 quarto, October 30, 1862, Farmville, Virginia, and reads in part: “...At the request of interested parties we have awarded that the Government of the Confederate States should pay, for each month while the said Government shall be in possesion of the property of the following persons Rent for said property..” Followed by list of property owners and amounts. Fine condition.